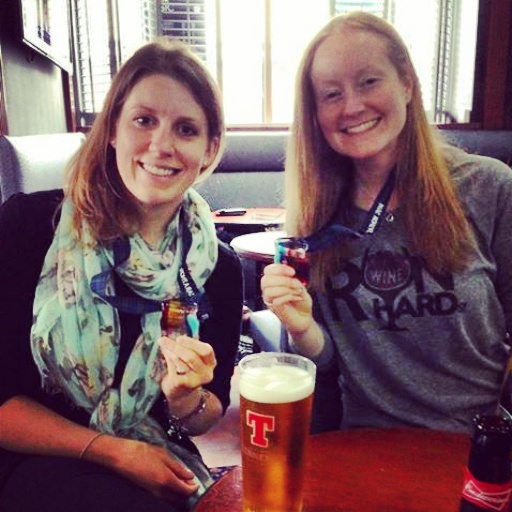 When I bullied persuaded Naomi to sign up for a marathon that was less than a week away, one of the sticking points was that it had no medal (I felt her pain). To get her firmly on board, I promised her that I would make medals for us once we had finished the race, and told myself I’d figure something out based on our experience. Well. Naomi unexpectedly ran a PB, and my gut feeling was that a chocolate coin taped to a shoelace wouldn’t really cut it. I began to construct a masterpiece. One of the things I enjoyed about Strathearn was the beautiful scenery in the sunshine. The course (helped by the weather) really highlighted why Scotland is considered one of the most beautiful places in the world. There were also pipers at the start, and at two points in the earlier miles of the race. Add this to the bright purple thistle flowers lining the roads, and you have a very ‘Scottish’ race! This made choosing the ribbon pretty easy – tartan. 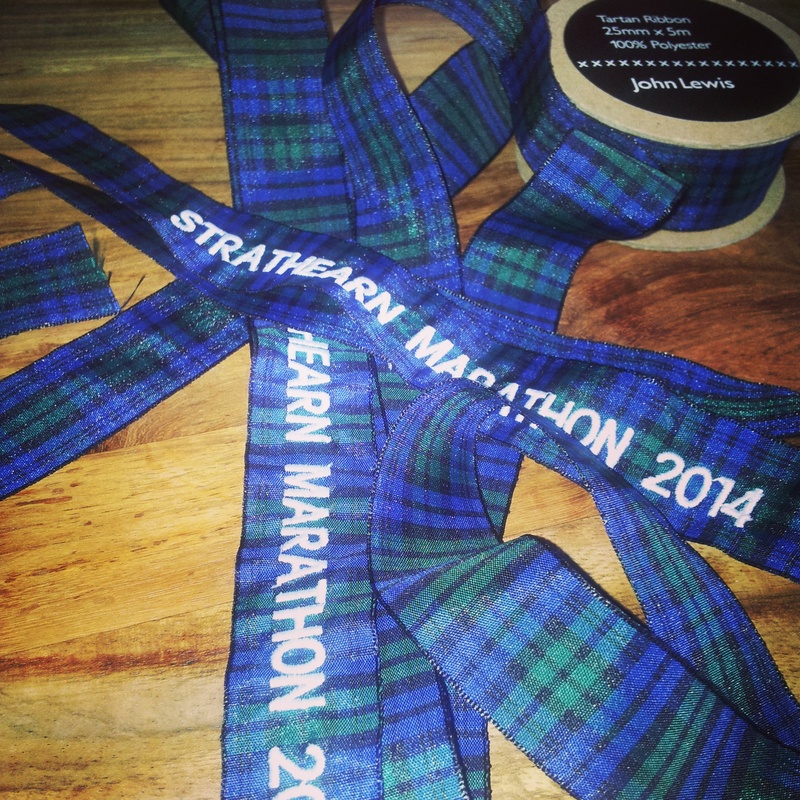 I opted for the one with greens and blues, and trawled the city to find someone who could embroider ‘Strathearn marathon 2014’ onto them. It turns out, not many places do this. After trying a few tailors, and some independent art shops, I was pointed in the direction of ABstitch, handily just down the road from me. I approached one of the women in the workshop who seemed unconvinced it would work (ribbon is too thin, and they’re used to embroidering logos onto heavy duty boiler suits), but after telling them what it was for, she said she’d give it a try, but wouldn’t guarantee they’d be any good. I reassured her that my only other option was to hand-stitch them myself, and I could guarantee they would be terrible. I got a message from her that night telling me the ribbons were ready, and I picked them up the next day. Although she didn’t think they were fantastic, I was more than pleased. And now for the important bit. I couldn’t shake, for some reason, the idea that I wanted something ‘natural’ for the medal, not a generic, buy-in-bulk bit of metal that you sometimes get for some of the smaller, local races. I ended up fixated on the idea of glass, partly because there is a local glass workshop also very near where I live. I popped into Oil and Glass on Friday afternoon and told the woman working there what I was looking for. As the shop was about to close, she recommended coming by for a drop-in session on Saturday, where I could speak to Shelagh Swanson, the owner, about customization. So that’s what I did. 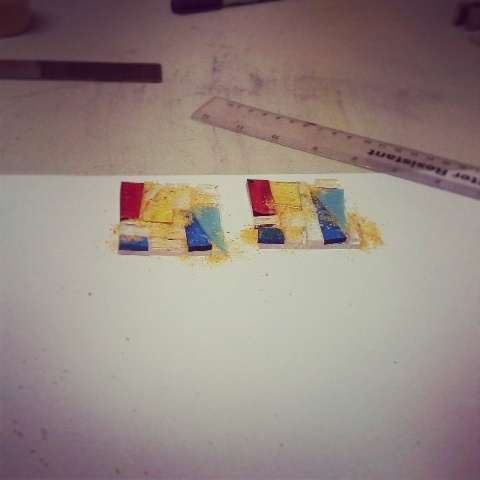 I think I lucked out, because when I popped in, there was nobody else there, so I had a quick lesson on how to create glass tiles, and, after showing her my ideas, a cheeky condensed lesson on how to measure and cut glass sheets. She was really accommodating, and within 10 minutes, I was left to my own devices. A bit later a kid came in with his grandmother to make a keychain for his dad (Father’s Day is tomorrow), and a couple of women came in to make some glass tiles. It was really relaxing, and I’m fairly sure I have terrified Ian by informing him that our new place will have customized tiles in the kitchen, by yours truly. The orange ‘dust’ is just fine pieces of glass (which will be red – they were out of clear), as I needed to fill in the gaps between the coloured chunks. I handed over my works of art, and was told they would be fired in the kiln that night, and would be ready to pick up the next day! On Sunday (the next day), I went for a long run in the morning, and then swung by the shop in my sweaty running gear to pick up the finished medals. Although one was upside down, I think they turned out really well, and took them straight home to put on the embroidered ribbon. 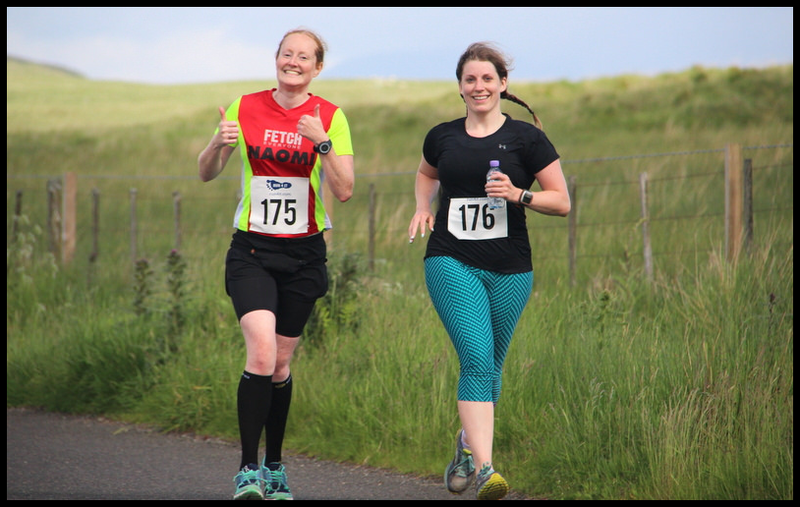 This entry was posted in Uncategorized and tagged aberdeen, glass work, medal, Oil and Glass, running, Strathearn marathon by MedalSlut. Bookmark the permalink. 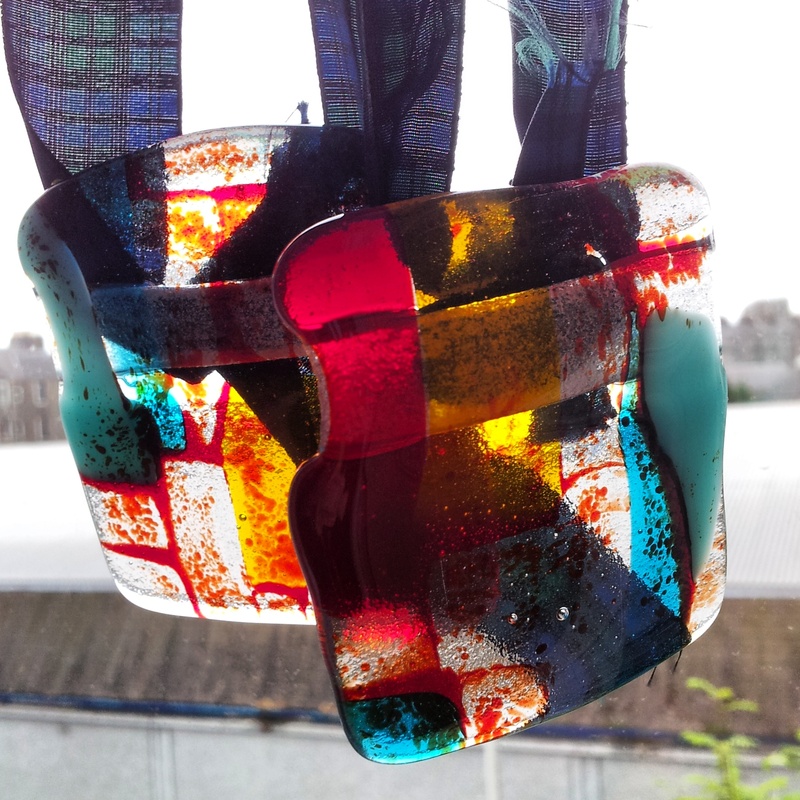 I love fired glass, I’ve got a star – made of reused Bombay gin bottles from Tiree- in my bathroom. Some of the stuff there was beautiful! I’ve definitely got ideas for our new place (when we find it!). I also love fired glass, but particularly when it’s irregularly shaped/warped. I picked up two Murano glasses in Venice and, no joke, they cheer me up just to look at them. Is that lame? I think that’s lame. I don’t even care. Sounds good. I’ll be taking a week off from running after the marathon. Then back to training for the Great North Run! Awesome creations — you have a knack for making things with your hands. First your drop bag and now this. 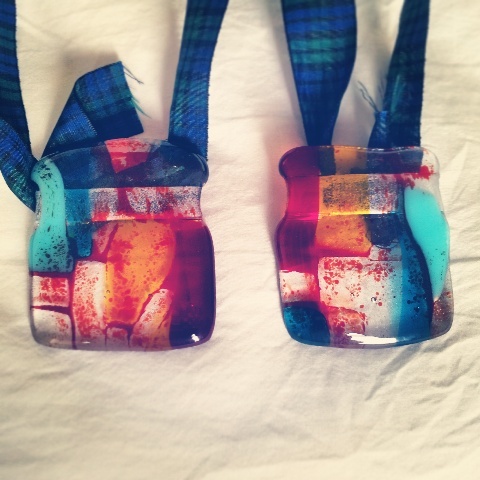 It reminds me somewhat of the medals the Park City Marathon used to give — they were stained / blown glass and had a very unique, classy quality to them. Your grainy look is a huge winner though. Much approval!